The Motorola Moto G has met plenty of success since its release and when it arrived for sale in India it sold out very quickly. Earlier this month we informed readers about an exclusive cash back deal on Flipkart for the phone, and now a new Moto G promotion is available on Flipkart offering free shopping and more. 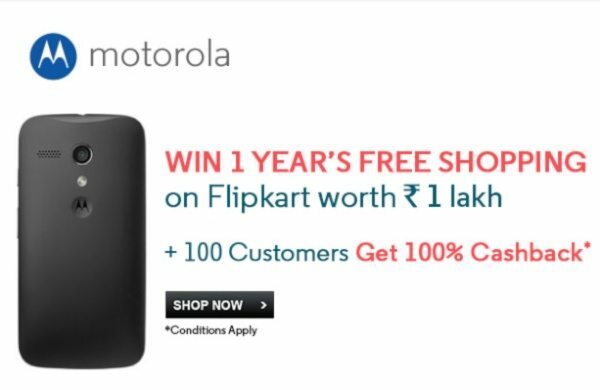 The new incentive could be very appealing for potential buyers of the Moto G in India as 100 lucky customers could get their full cash back on the purchase of the Moto G. As well as this there’s an amazing prize for 1 lucky winner of a year’s free Flipkart shopping to the tune of a voucher for Rs. 1 lakh. The Rs. 1 lakh voucher is valid to April 30th 2015 while those receiving the full cash back will get it in the form of a Flipkart E-Gift voucher, also valid until April 30th next year. The offer involves those taking part answering a Moto G-related question and sending it to Flipkart by SMS along with the order ID of the device. If you are one of the lucky winners you will be notified by SMS and email and the full list of winners will also be posted on the Flipkart Facebook page on May 7th. Are you going to buy the Moto G on Flipkart and take advantage of this current promo?